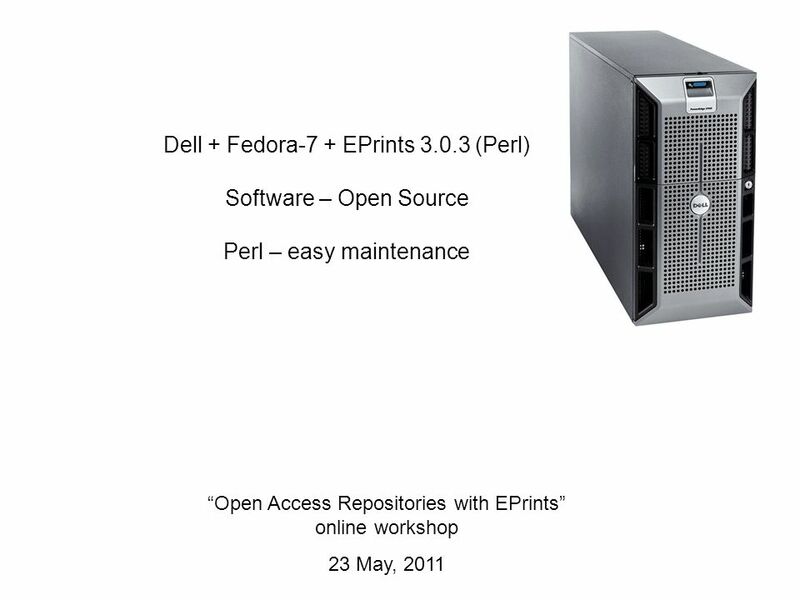 8 Open Access Repositories with EPrints online workshop 23 May, 2011 Thank you ! 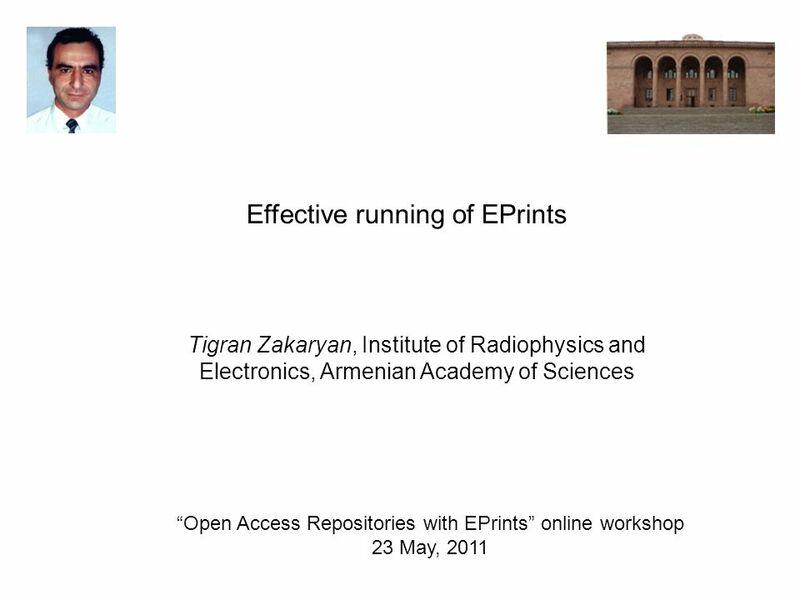 Download ppt "Open Access Repositories with EPrints online workshop 23 May, 2011 Effective running of EPrints Tigran Zakaryan, Institute of Radiophysics and Electronics,"
Más de 1000 repositorios a su disposición OpenDOAR y ROAR IX Worksop REBIUN, Salamanca, 2-3 Oct.2009 Peter Millington SHERPA Technical. 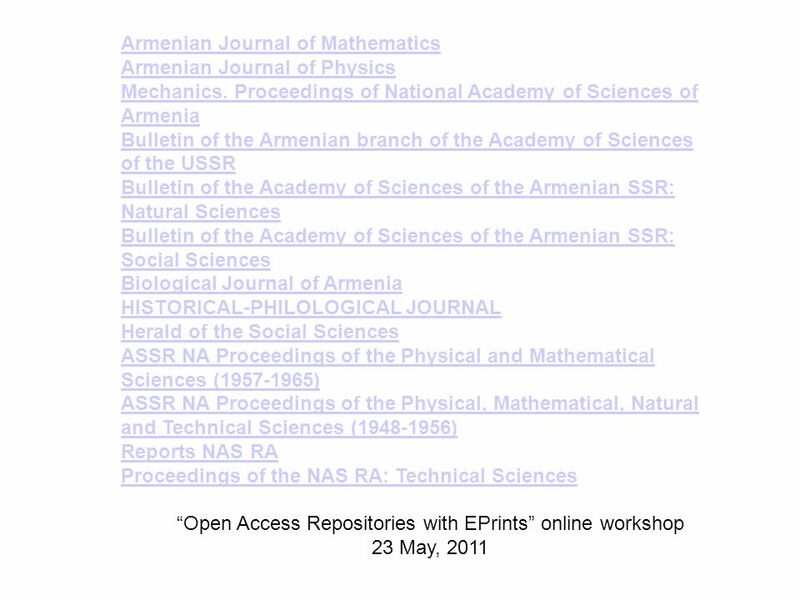 OPEN ACCESS INITIATIVES IN ARMENIA, AZERBAIJAN, AND GEORGIA John Carey Hunter College Health Professions Library. Armenian ICT Industry overview and the role of the Union of Information Technology Enterprises in promotion of ICT/High Tech Development in Armenia. 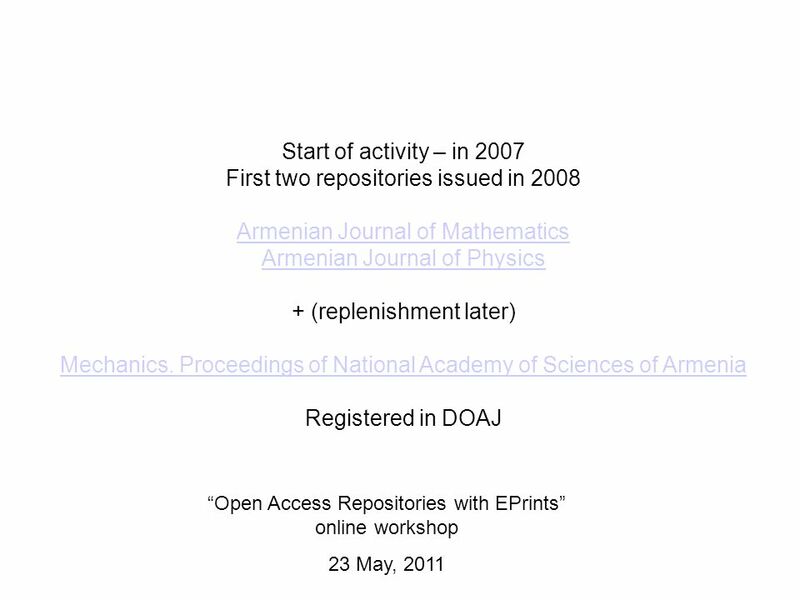 OPEN ACCESS Polish P rojects Bożena Bednarek-Michalska Nicolaus Copernicus University Library. Version Policies and the OpenDOAR Policies Tool Peter Millington, University of Nottingham Version Identification Workshop, London, 22-Apr-2008. Putting Eprints Software into the User Community An invitation-only international roundtable workshop organised by JISC and the School of Electronics and. Putting EPrints Software into the User Community User Issues : round table discussion SOAS, London 23 June 2004 Pauline Simpson Project Manager TARDis. DRIVER-II: Mentor Service Mary Robinson SHERPA, University of Nottingham. OpenAccess.se First DRIVER Summit, January 2008 Göttingen Jan Hagerlid, National Library of Sweden, co-ordinator of. OpenDOAR and ROAR RSP Services Day, Bath, 15 th Jan.2009 Peter Millington SHERPA Technical Development Officer SHERPA, University. RoMEO RSP Repository Administrators Workshop 11 th August 2010 Bill Hubbard. 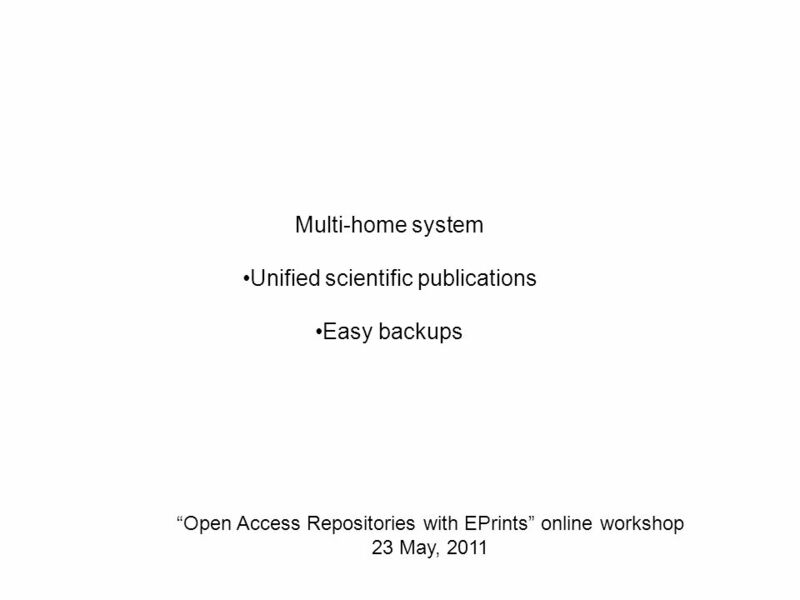 Welcome to the Open Access Repository World! University of Glamorgan, 22 nd May 2008 Peter Millington SHERPA Technical Development. Theo Andrew, Edinburgh University Library Choosing Suitable Open-Source Repository Software Choosing Suitable Open Source Repository Software Theo Andrew. Maira Bundža Western Michigan University IFLA Satellite Post-Conference Tallinn, August 18, 2012. 1 Answer to the Questions and Comments on the Services of the National Diet Library NCC 2007 Open Meeting Friday, March 23, 2007 Nobuya AIHARA Reader Service. Open Acess in Ukraine: Cooperation with the policy makers Iryna Kuchma, eIFL OA Program Manager, eIFL.net Presented at the workshop OPEN ACCESS: NEW MODELS.